Shepherds Meadow is now installing underground dog fencing. Pet containment is an extremely big concern being a breeder. 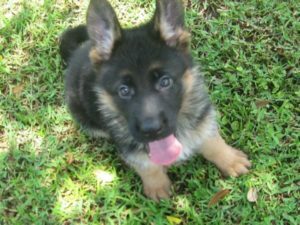 People have many questions for their breeder in deciding if the breeder can suit their needs. I also have many questions for my prospective clients deciding whether this will be a good, safe and controlled environment for my animals. Unfortunately I cannot physically visit every home prior to placing a pup. But I can ask a lot of questions and I do. One of which is “Do you have a fenced in yard”? Non visible fencing has many advantages over chain link fence. We have installed both and can help you make the right choice based on your pets temperament. Underground Electronic fencing is much easier and faster to install. It is out of sight and your property does not look like a kennel. It is much less expensive than commercial 9 gauge fencing recommend for a large adult German Shepherd. You cannot prevent a child or another animal to walk unknowingly into the area. With that said, if we feel your animal is overly aggressive, Shepherds Meadow WILL NOT install Non visible fencing. Fencing should not only contain and protect your animal,but protect the public as well.